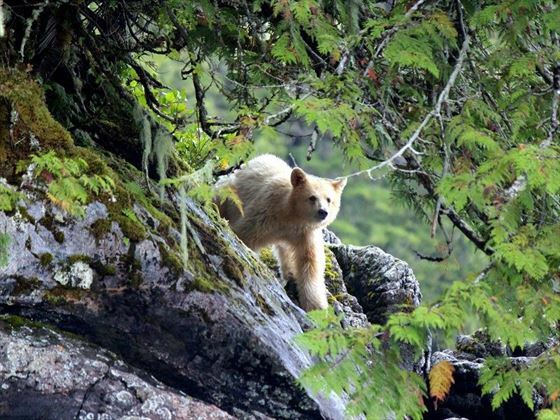 The elusive Kermode bear, otherwise known as the ‘spirit bear’, is a must-see for wildlife enthusiasts wanting to tick all of Canada’s more unique animals off their list. 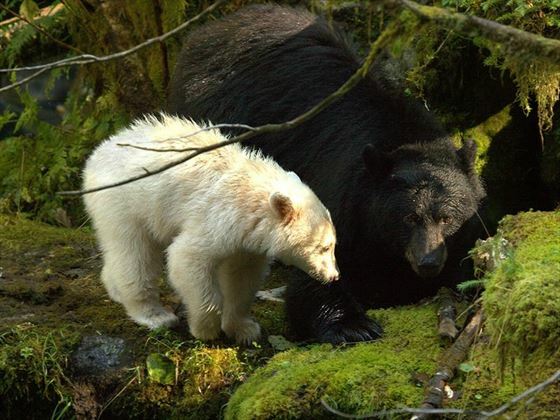 A rare subspecies of the American black bear, these magnificent, white bears are the provincial mammal of British Columbia. 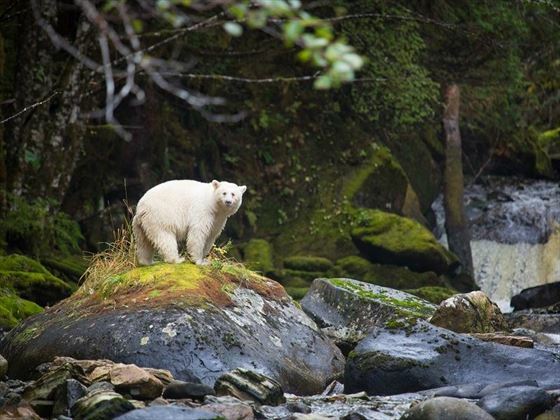 This brilliant four-night tour gives you ample opportunity to see the gorgeous spirit bears in their natural habitat, catching salmon from streams and lazing in the sunshine by a trickling estuary. 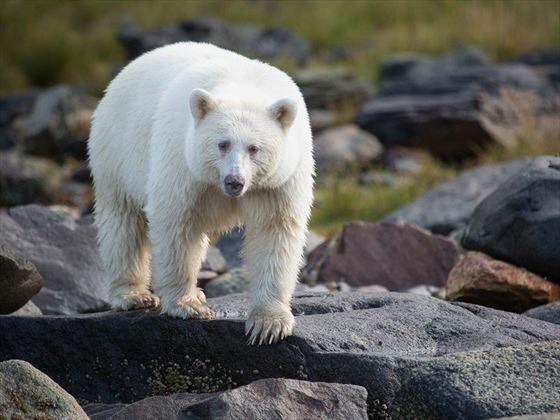 Staying at Spirit Bear lodge, your days will be spent tracking nearby spirit bears, as well as choosing from a range of other excursions, including kayaking, enjoying cultural First Nations tours, walking through rainforests, whale watching and enjoying educational evening entertainment. 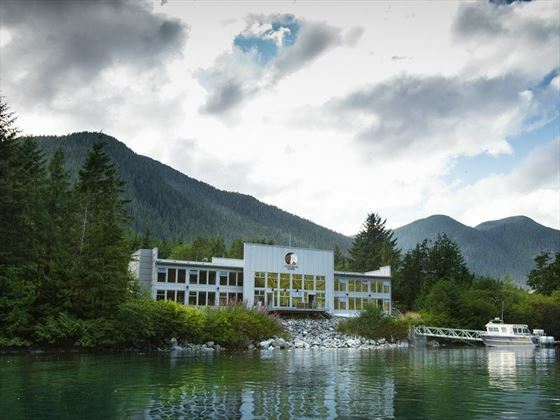 An ecotourism venture owned and operated by the Kitasoo/Xai’xais First Nations people, Spirit Bear Lodge is a charming and welcoming hotel nestled along the waterfront in British Columbia’s verdant Great Bear Rainforest. 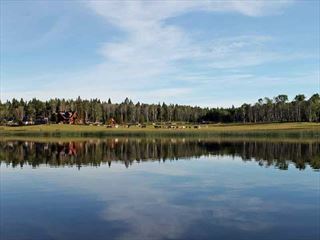 There are only 12 rooms altogether, making for a quiet and secluded stay. With architecture paying homage to the traditional long houses built by West Coast First Nations over thousands of years, the interiors have a cosy cabin vibe, with every room offering gorgeous ocean or forest views from the floor-to-ceiling windows. 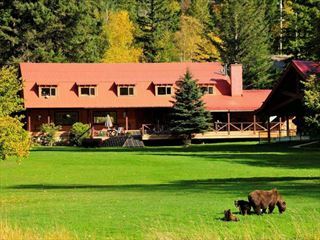 Inspired by the First Nations heritage, Spirit Bear Lodge encapsulates the natural wilderness and the peoples’ welcoming and friendly spirit, and this five-day tour will introduce you to the wonderful spirit bears that make this verdant area their home. If you would like to add another tour, a few days in Vancouver or some time in and around Vancouver island, then we will be happy to tailormake a quote for you. 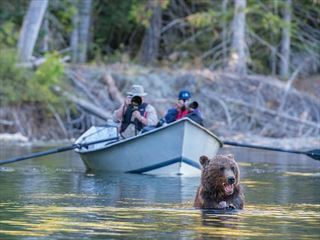 Travel inspiration: Experience bear watching in British Columbia's wilderness and read our overview to the Cariboo Chilcotin Coast region and discover more about the "land without limits". Begin your day with a journey to Spirit Bear Lodge, which includes flying on a Pacific Coastal Airlines flight from Vancouver South Terminal to Bella Bella. 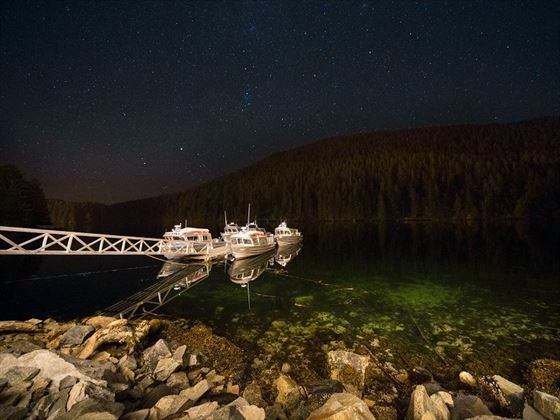 Once there, you will be given a van transfer to the Bella Bella town docks, where you will be picked up by the Spirit Bear Lodge water taxi for a lovely 90-minute boat ride to Klemtu and Spirit Bear Lodge. Your arrival in the afternoon will leave you time to enjoy a brief orientation, before spending the rest of the day relaxing and enjoying the amenities of the lodge until dinner and evening entertainment about the local coastal ecology. After an early breakfast, you will meet on the dock at 8am for your first full day of bear viewing at one of the main grizzly viewing creeks. 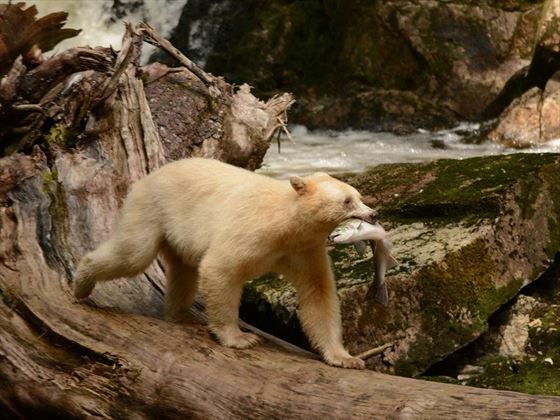 After hours of amazing bear sightings, head back to Spirit Bear Lodge for 6pm for a buffet dinner at 7pm, followed by a fascinating presentation on aspects of Great Bear Rainforest, bears, or the First Nations culture. You’ll enjoy another full day of Spirit Bear watching today, by boat and foot. 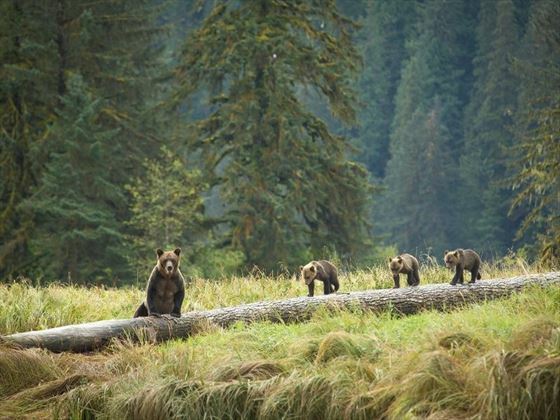 Your experienced guide will take you to the best viewing areas for the local bears, given you a great chance to see these gorgeous, elusive creatures. Dinner is back at Spirit Bear Lodge at 6pm, alongside the evening programme. Today you’ll have a choice of guided excursions. 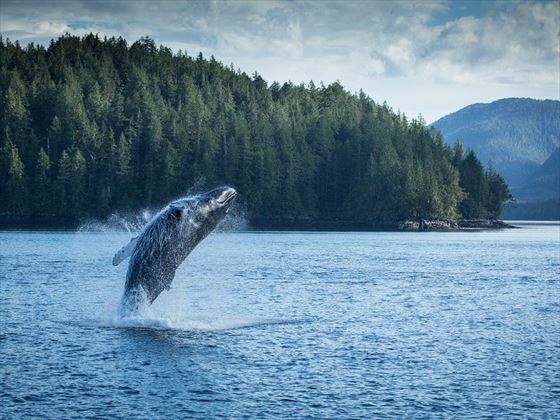 Choose from a Spirit Quest to one of the Spirit Bear Conservancy’s luscious valleys, whale watching in Finlayson Channel, a grizzly viewing tour to Fiordland Recreation Area, a First Nationals Cultural tour to United Nations World Heritage Candidate Site Dis’ju, or a leisurely sea kayaking day trip. 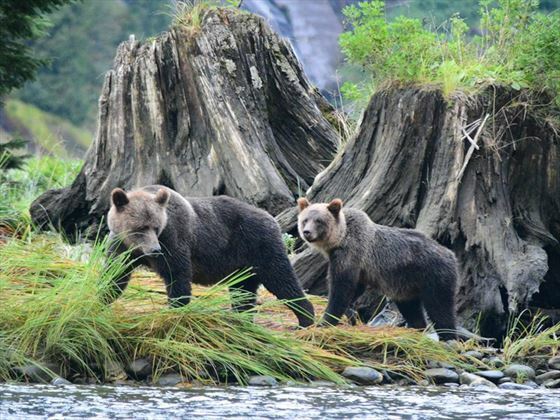 Your final day can be spent doing one of the following excursions: a morning sea kayak along the peaceful shores south of Klemtu, a rainforest walk, a cultural tour, or another grizzly tracking tour. 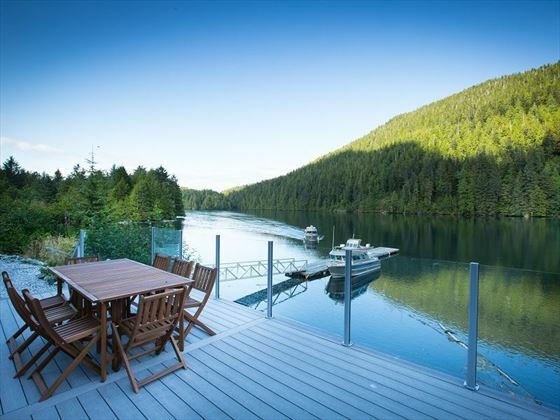 Once you’ve enjoyed an early lunch, you will transfer 90 minutes by water taxi to Bella Bella at 11am, arriving in time for a shuttle to the airport and a Pacific Coastal Airlines flight back to Vancouver South Terminal. Arriving in Vancouver between 5pm-7pm, you will board your onward flight.